The best of Maremma Restaurants in Piombino Italy: a collection of my favourite restaurants in the Etruscan port of Piombino where you will always "mangia bene" - eat well. Bar and Ristorante La Sirena has nothing special to distinguish it from the outside: a regular looking Italian bar with outdoor plastic chair seating and a covered area for dining during the summer months... But walk inside and the bar itself is an Aladins cave of bottles of wine and liquers - opening onto an intimate restaurant area to the right - also surrounded by bottles of wine... one of which will set you back Euros 2,650.00! 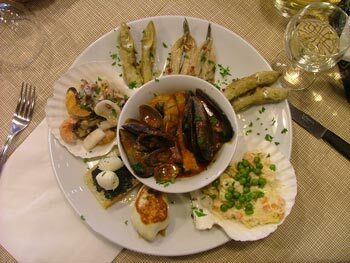 La Sirena is a fish restaurant serving typical local Maremman dishes - "cucina tipica locale". There is no printed menu: the owner Andrea will reel off the dishes for the day when he comes to take your order - so take an Italian or phrase book with you! I especially enjoy eating out when there is no menu as it adds an edge of excitement tinged with "preoccupazione" (worry) because in the speedy exchange I am never 100% sure of what will arrive! 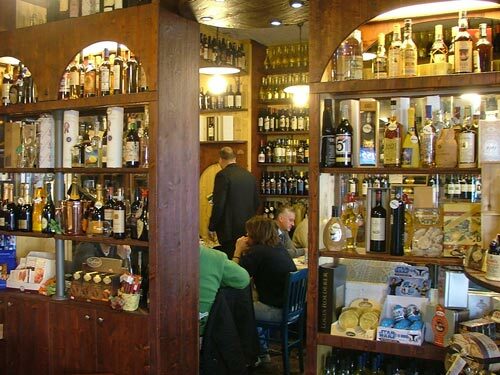 It is a small "ristorante" and a popular one, so be prepared to wait for a table, especially in the winter months when the outdoor eating area is closed. Having said that, at lunch times the wait isn't usually for very long as many people are on their lunch breaks. The clientele at La Sirena is a very eclectic mix: the last time that I ate there I dined with "operai" (workers), business men in very smart suits, a lady wearing more diamonds on her fingers than I have seen in the window of Cartier, a Harley Davidson motorbike rider, and regular locals. The portions are wonderfully generous, so depending on your appetite, you might want to consider an antipasto followed by a primo piatto of pasta or riso, or an antipasto with a secondo piatto. The antipasto in this photograph is for one person. As a guide to costs, a great tasting meal of one mixed antipasto between two, two plates of pasta such as Penne di Astice (lobster) and Carbonara di Mare, half a litre of house white wine, a bottle of water, and two coffees will set you back around Euros 40.00. 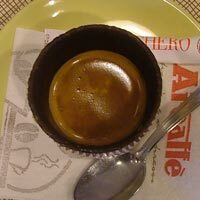 About the coffee: it comes in dark chocolate-lined biscuit cups! Wonderful. I now want to only drink my expresso like that!